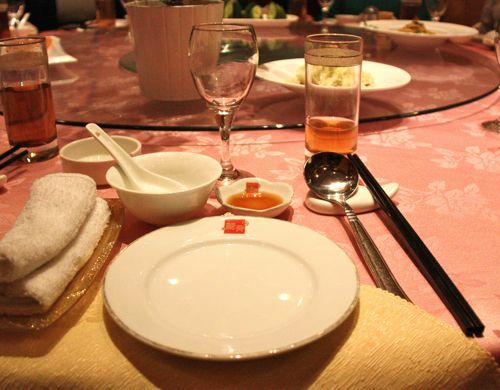 If it's your first time at a fancy Chinese banquet, you might feel nervous that you're going to use the wrong utensil or put something down incorrectly. Luckily, everything is pretty easy to understand and Chinese dining etiquette is actually quite relaxed. So worry not, simply read this article and go enjoy your meal. There is a photo included with this article. Starting at the left and working around, you'll find the following items. Below, is an explanation of what each of these is used for. Note, this set is probably the maximum number of items you'll have at your table. Depending on the simplicity of the restaurant, you may find only the bowl, plate and a set of chopsticks. The cloth is to wipe your hands before and during the meal. Some Chinese food requires the use of your hands so it is useful to have the cloth. You won't always be given it and sometimes there may be a small charge for it. There is a regional difference to use. In the south, people serve themselves from the communal dishes into their small bowl and spit bones, skin, etc. onto the plate. Elsewhere, the bowl is saved for soup or fried rice. If you use your bowl for food and then are served soup or fried rice (that comes typically at the end of a meal), then simply ask for a clean bowl. This small bowl is used for dipping sauce. Typically Chinese vinegar which is a rich brown color is served here. Usually soy sauce is not used for dipping. At a dinner setting, a wine goblet might be present. It will be used to serve any communal alcohol you order. Don't be surprised if when the alcohol is poured the glass is filled right to the top. This is normal at Chinese dinners but the faster you drain your glass, the faster it will be filled, so do be careful. Typically the service also includes a tea cup. Sometimes tea is served in a glass. The table setting won't always have a spoon but will always have chopsticks. Often, your plate gets filled with sauce or other things and you might require a clean one as new dishes are served. Ask your server for a new one - it is totally expected and appropriate. In some cases, they will automatically give you a new plate when a new round of dishes is served. It is actually pretty rare to find a cloth napkin in a Chinese restaurant. If you do have one, the etiquette is to put one corner under your plate and then let it hang into your lap. If you feel more comfortable putting the napkin in your lap, this is acceptable. You won't find a specific bowl for rice at the table. In fact, you won't be given a bowl of white rice unless you specifically ask for it. Fried rice, if ordered, will be served family-style in the center of the table. White rice will be served in individual bowls. Rice is typically eaten at the end of the meal. If you want to have rice with your meal, then you must ask for it from your server. Often you must ask repeatedly for it as they don't think to bring it when the dishes are served.